The Irish Cup final is to be staged at the Oval because of damage to a stand at the usual Windsor Park venue. The decision, made by the Irish FA's Challenge Cup Committee on Friday, hands home advantage to Glentoran for the 2 May showpiece against Portadown. It is not known how long Windsor Park, which also stages Northern Ireland's home internationals, will be closed. 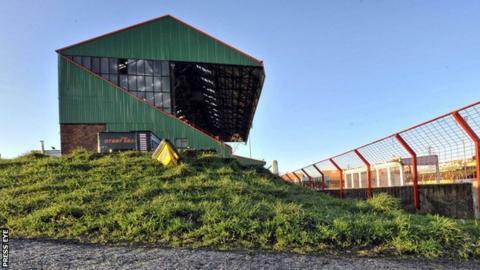 The IFA said they were still awaiting an evaluation of the damage to the west stand. Cracks were discovered on 31 March, two days after 4,000 spectators had filled the stand for Northern Ireland's game against Finland. The main concern for the governing body is whether Northern Ireland will be able to play the 13 June Euro 2016 qualifier against Romania at their home ground.